c. Minimum of 2 workers for this task. Prepare client's arm for roll. If bed has brakes, put these on. Ensure bed height is at hip height of tallest worker if possible. 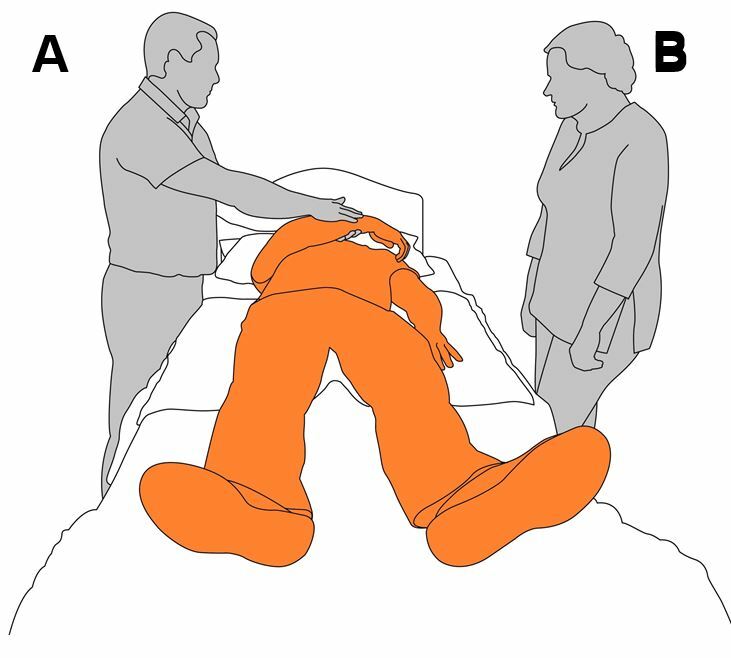 Worker on side of bed that client to roll away from places client's arm across chest. Put client's leg in position for roll. Bring client's leg up by bending it at the knee. Task to be done by first worker, as in Step 1. Staff position hands to commence roll. First worker has hands on client's hip and back of shoulder. Second worker with hands on client's elbow and knee is not required to lean and is in comfortable standing position. Second worker counts in the task (for example - 1, 2, 3). 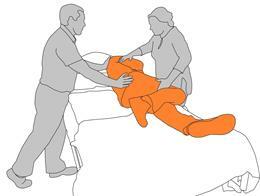 Workers use combined pushing/pulling motion to gently roll client on to side. First worker does a pushing action, and second worker does gentle pulling action. When client on side, workers are to ensure the client is stable and will not roll back. Second worker to reposition hands on hip and upper trunk. If intention is to reposition client, roll client back once a slide sheet has been placed at their side. Make sure client is comfortable and in a supported position. Place any equipment in correct storage areas.